ATEX approved for Zone I and Zone II hazardous areas. Certificate number SIRA 03 ATEX 1382. 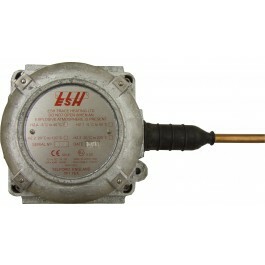 Suitable for gas groups IIA, IIB, and IIC. Protection Exd. IIC T6. HZ thermostats are designed for the control of surface temperatures of trace heating pipes and vessels within a hazardous area. Types HZ1, HZ2 and HZ3 have a protected capillary tube with surface mounting sensor bulb. Type HZA is an air sensing model for frost protection purposes. All thermostats are adjustable over a temperature range and are ‘ON – OFF’ units with an electrical switch operated by expansion of the liquid in the sensing bulb or capillary.